The ticket price includes a drink. Buscot Park will be open to theatre-goers from 6:30pm. Picnics welcome. The performance on the 12th is for charity and by invitation only. 800 years ago, in 1218, Faringdon received its Market Charter, from Henry III, and became a Market Town. 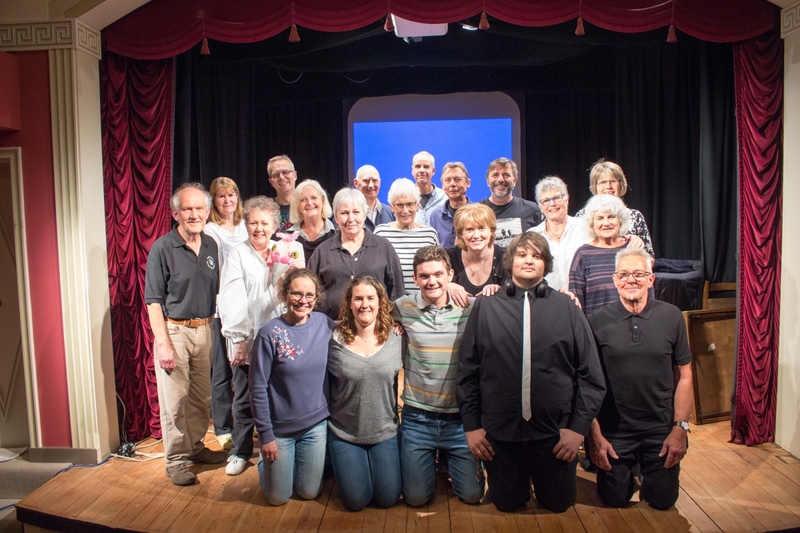 70 years ago, in 1948, Faringdon Dramatic Society was founded. FDS wanted to celebrate both these events but how, we wondered, should we go about it? We’re a drama group, not an historical society and our audiences want to see entertainment, not come to a lecture. 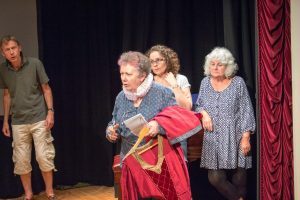 How does a drama group put on a show? 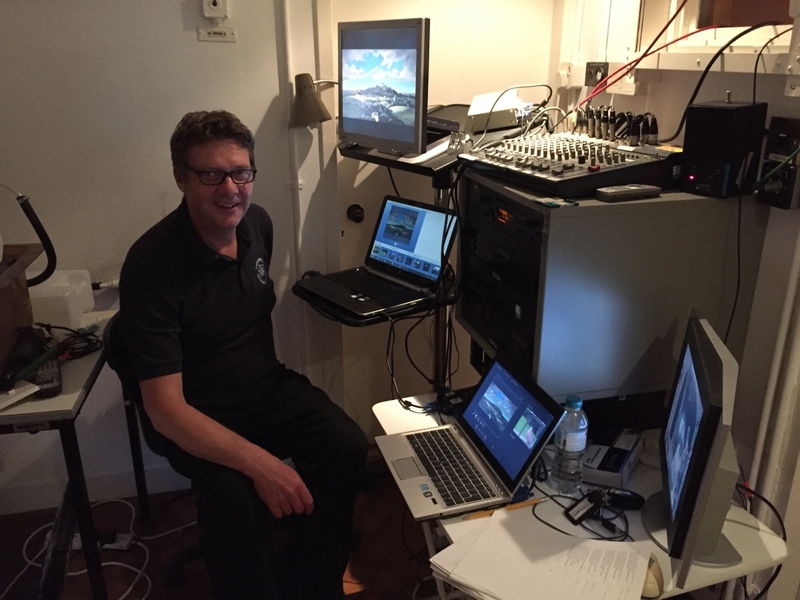 Perhaps it would be interesting to show our audience what goes on backstage as well as in front of the curtain. 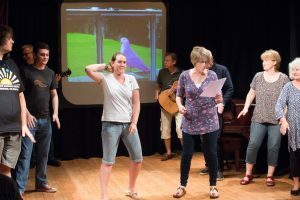 So we decided to tell the story of how we developed this production, one that celebrates Faringdon past and present, through songs, sketches, poems and short plays, as well as some wonderful photographs and film of our lovely home town. 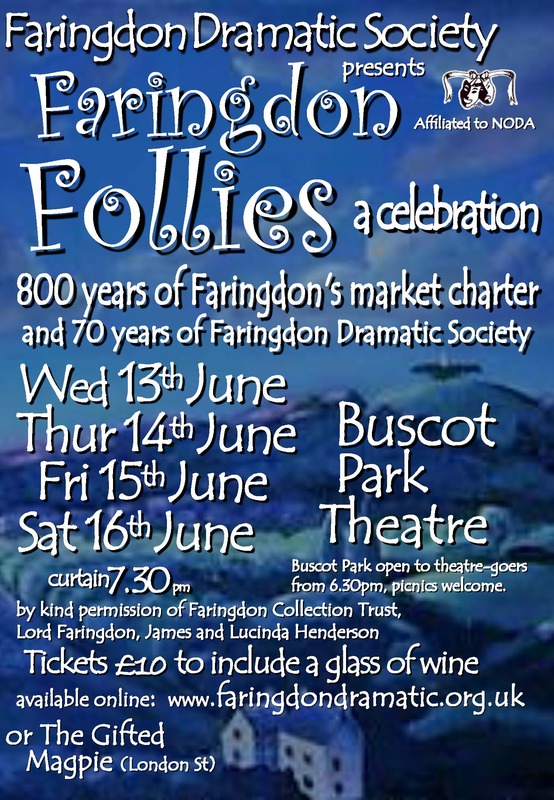 “Faringdon Follies” is the resulting show and of course, where could be better than Lord Faringdon’s own theatre in Buscot Park to perform it! Colonel Lisle’s Decision a short melodrama by Peter Webster, being a fictional incident in the English Civil War. The date is April 30th 1645, the day after Cromwell’s failed assault on Faringdon House! – visit Peter’s website for details. The Ballad of Hampden Pye by Ian Bateman – A local folklore ghost story from Faringdon. The story is based on historically accurate characters, but over the years has become embellished. The church at Faringdon had its tower blown off by cannon fire in the Civil War, and this has somehow got mixed up with the fate of Hampden Pye! – see video. Market Charter Rap – ‘This is our town’ – see video. In the Presence of the Lord (excerpt) by Bob Canning. Pigeons In The Park – adapted from a Tom Lehrer song by Duncan Sinclair. 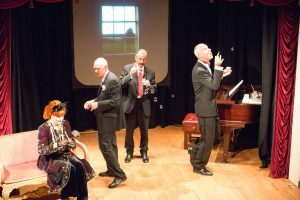 Memories of The Folly – Readings by Peter Webster, Val Hughes, Sjoerd Vogt, Tom Sutton, Jane Rennells. Faringdon Folly Film by Tom Woodward – Faringdon Folly was built for the extravagant Lord Berners in 1935 and stands 140 feet tall. When questioned about the point of the tower by the planning subcommittee, Berners famously remarked “the great point of the tower is that it will be entirely useless!” – see video. Faringdon’s Market Charter – On 7th March 1218 during the reign of Henry III, the Shire of Berkshire was ordered to ensure that the market in Ferendun be henceforth held on Mondays. A market was probably held previously on Sundays and it was later changed in 1313 by another royal charter to Tuesdays. Faringdon was transferred from Berkshire to Oxfordshire in 1974. Derivation of Faringdon – Around 550 BC – 550 AD various peoples (Celts, Romans, then Angles from the south of Denmark and Saxons from Germany) came to these islands and worked there way up the River Thames and the ancient Ridgeway track, building hill forts on the dunes/downs south of the river. (Celtic/Gaelic dùn meaning ‘hill or hill fort’). Settlements developed around the freshwater springs at their base. Among them were those along the edge of the ‘Vale of the White Horse’ that were eventually given descriptive Anglo-Saxonised names like ‘Swine dùn’ (Swindon), ‘Blunt’s dùn’ (Blunsdon) and ‘Fern dùn’ (Faringdon). Say the latter like a Scot with a rolling Celtic/Gaelic ‘r’ – ‘fair-ren-duon‘ and you can see where we are going with this. The name ‘Faerndun‘ first appears written down in the Saxon Chronicles referring to the death of the Wessex king, Edward the Elder in 924 AD, around the time when England was being united into a single kingdom. It also states that it was in ‘Miercna‘ (Mercia) so not actually this town, which was near the border in ‘Westseaxna‘ (Wessex), but it does remain as the most likely origin of this and similarly named towns. The spelling and pronunciation has evolved over the years; becoming ‘Ferendone’ (1086), ‘Ferendun’, ‘Farendon’, ‘Chepyng (Market) Farendon’ (1218), ‘Faryndon’ (1327) and then almost finally ‘Chepyngfaryngdon‘ or ‘Faryngdon’ (1501). The current spelling appears on old maps of the area (1753/1761) but sometimes with a double ‘r’. It may be interesting to note that the nearby homestead/hamlet of ‘Fernham’ has remained practically unchanged. Faringdon Dramatic Society – Way back in 1948, Bill Reeves ran an evening class which proved popular and developed into ‘Play Reading’ sessions … read more history of FDS. 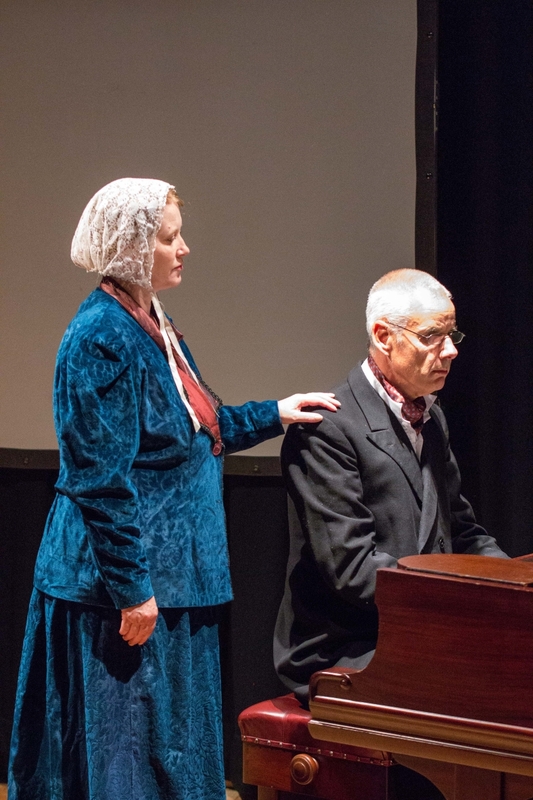 "Tuesday evening's Charity Gala Performance in support of 'The Place'"
Thoroughly entertaining performance, emotional at times, dont forget your handkerchief! Fascinating insights into the Faringdons history for both old and new residents.Delightful venue and a superb evening all round. A must see for those who enjoy all things Faringdon. "I am a Newbie … only moved here in 2004"
Went tonight, It was awesome! First time I have been in that amazing little theatre at Buscot! Loved it … cried at the workhouse scene …. fabulous music especially "Mad about the Boy" … fabulous young actor who played lots of parts, and loved the pink pigeon and dancing fossils costumes which were way beyond bonkers! What a fantastically imaginative, quirky and thoroughly entertaining production! We loved the way it was a play of setting a play, and the brilliant photos, songs, costumes and mini-plays. It would be a HUGE shame if you cannot film it, for historical reasons apart from anything else. Thank you all, FDS, very, very much indeed for a superb evening! 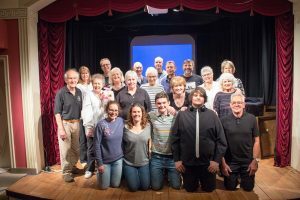 "We had a very enjoyable and informative evening"
This was a clever production which successfully combined 2 celebrations. The theatre is charming , we had excellent seats, could hear every word and the combination of singing, humour and serious cameos worked well. "A wonderful celebration of all things Faringdon!" We really enjoyed this delightful production. When my wife first told me she’d got tickets I wasn’t sure what we’d be seeing, but I’m so pleased she did. It was a wonderful evening celebrating the glorious history of our lovely town. Some excellent individual performances, but it was nice to see the camaraderie of the whole cast. Marvellous. Well done! What a brilliant show – well done Debbie, Carolyn and the cast. It was touching, informative, fun and funny in turns. I thoroughly enjoyed it. I was glad to see Peter Webster's play Colonel Lisle's Decision finally performed for an audience. It’s clever and quirky and very well put together. "It was informative and enjoyable"
We did not know what to expect and were very pleasantly surprised. It was amusing and we learned a lot about Faringdon. The cast obviously enjoyed it too. "An enjoyable musical and variety trip through Faringdon's recognisable history." It was an all round enjoyable experience with our friends in very comfortable surroundings. Our first visit to Buscot House we will be pleased to return for other performances. 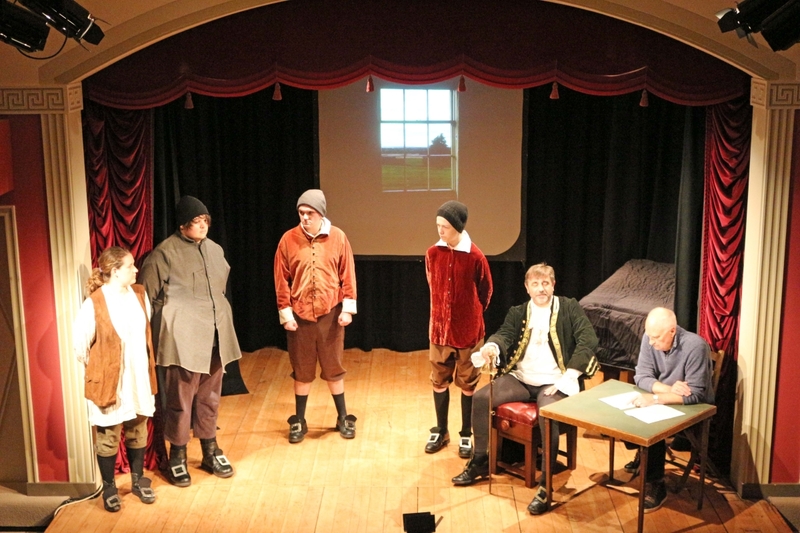 It was relevant because we recognised much of detail contained within sketches which we well delivered by the cast. Length fine, music and performances good. 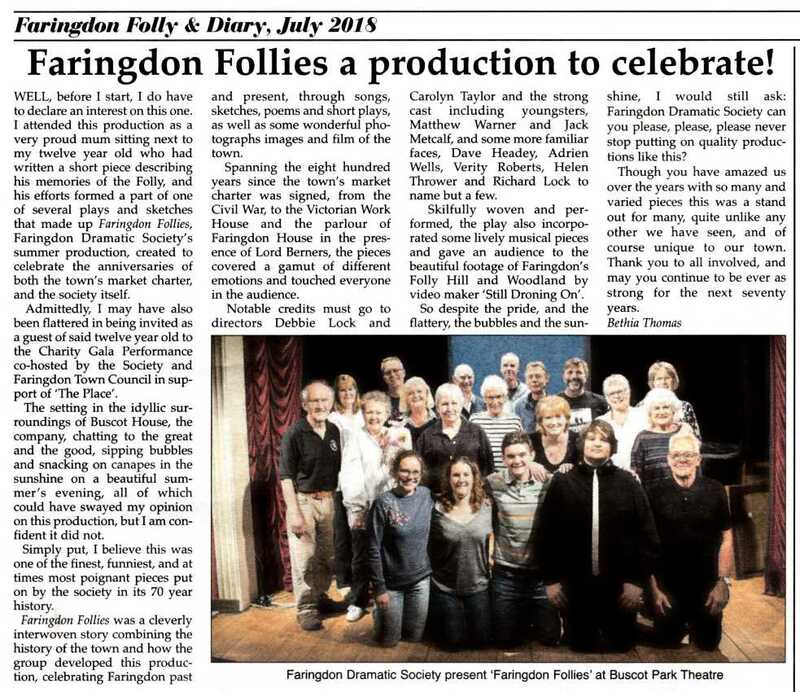 "Amazing display of local talent"
Impressive allrounder – and tribute to the continuing vitality of FDS after 70 years! A very enjoyable evening with an excellent story and cast. The songs were amusing and the story line was interesting and informative. 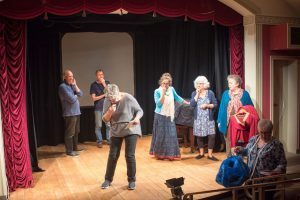 "Faringdon Follies was something different – a genuine piece of community theatre celebrating local identity and a strong sense of place and rootedness." This performance was SUCH a great production – genius writing, & performed really well. All actors could be heard well and were confident & word perfect. If there was any criticism it would be that at the very beginning of the performance, some actors were to stand with their backs to the audience (why? ), which obscured vision to some characters on the stage. 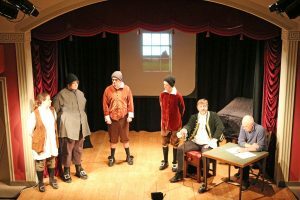 Saturday evening "Feeling happier about Faringdon"
We did enjoy last night's production. Lately, with all the changes going on in Faringdon, we have felt quite "dis-chuffed" but after last night feel happier. The production proved that what keeps us here is the people. As always a great performance.